When we want to say that something was happening in the past, we use the verb to be and –ing. This grammar is called the past continuous. We use the past continuous with action verbs such as go, run, play. We don’t use it with verbs such as know, understand, want or need because these are not action verbs. We use the past continuous in about 1% of sentences in spoken English. I won the match. It means that at the end of the match I was the winner. I was winning. It means that I was ahead at some point during the match. We use the past simple for things which happened. We use the past continuous for things which were happening. 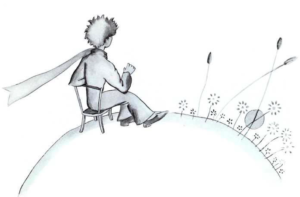 The little prince was thinking about his past. Then we were talking about something. The little prince was watching a beautiful sunset.